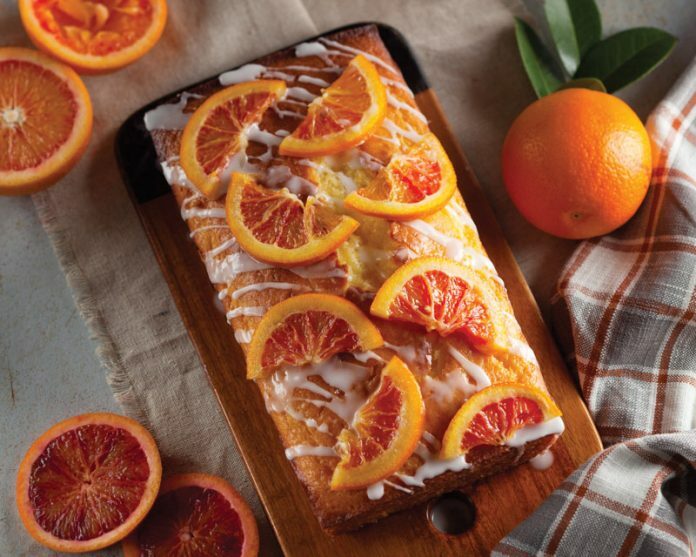 The addition of zest, glaze, and a candied citrus garnish heightens the subtle blood orange flavor in this orange loaf cake, which manages to be moist without being dense. Preheat oven to 350°F (180°C). Spray an 9x5-inch loaf pan with baking spray with flour. Line pan with parchment paper, letting excess extend over sides of pan. Spray again. In the bowl of a stand mixer fitted with the whisk attachment, beat sugar, sour cream, eggs, and orange zest and juice at medium speed until combined, 3 to 4 minutes, stopping to scrape sides of bowl. In a medium bowl, whisk together flour, baking powder, and salt. Reduce mixer speed to low. Gradually add flour mixture to butter mixture, beating just until combined. Add oil in a slow, steady stream, beating until combined. Pour batter into prepared pan. Bake until golden brown and a wooden pick inserted in center comes out clean, 35 to 40 minutes. Let cool in pan for 5 minutes. Remove from pan, and let cool completely on a wire rack. Drizzle with Blood Orange Glaze. Garnish with blood oranges, if desired. In a small bowl, whisk together Blood Orange Simple Syrup and confectioners’ sugar until smooth. In a small saucepan, bring sugar, ¼ cup (60 grams) water, and orange zest and sections to a boil over medium-high heat. Let boil for 5 minutes. Reduce heat to low, and simmer for 5 minutes. Remove from heat, and let cool. Strain mixture through a fine-mesh sieve, discarding solids. Cover and refrigerate for up to 2 weeks. Just made this, and wonder if there is a typo or omission in the recipe? I’m a pretty experience baker, but a little confused by the “Gradually add flour mixture to butter mixture” instruction since there actually isn’t any butter in it. Had to cook my loaf for a total of 65 minutes (in a convection oven no less) and while the toothpick eventually came out clean, the bottom half of the loaf remains dense and uncooked. Super disappointed, and would love to know where I went wrong since I weighed all the ingredients and followed the instructions as outlined in the magazine copy. Thanks! 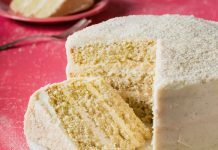 Again, we are sorry about the errors within the recipe but hope that you will be able to take these edits and make it again, in all of it’s citrus glory! I tried making the blood orange cake and it did not turn out well at all. Is there supposed to be butter in this? 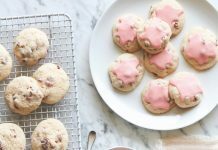 the directions say to add the flour to the butter mixture, but butter is not listed in the ingredients – is this why it turned out heavy and flat? We apologize for the error and hope that you will give this cake another shot. Happy baking! 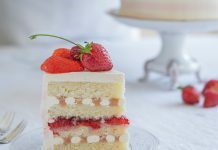 I wanted to try this cake, however, after reading the reviews and answers I trailed the web link to get correct recipe and you needed a password to move forward?. Why would you put a password protection link on an answer to a much needed recipe correction? Thank you for reaching out! Which links are you trying to get? This is the corrected recipe for the Blood Orange Loaf Cake. Please let us know how we can help. Happy Baking!